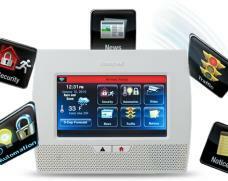 Honeywell Wireless Lynx Touch 7000 security system. 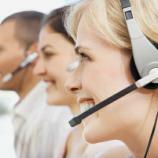 This wireless security system can either utilize landline monitoring or wireless cellular monitoring. 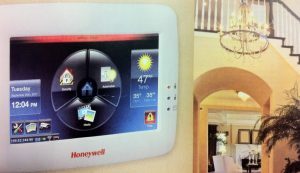 Notable features include: Honeywell’s LYNX Touch features a bright, full-color touchscreen with graphic icons and intuitive prompts for easier operation, advanced alarm communications features and appealing home automation and control capabilities. 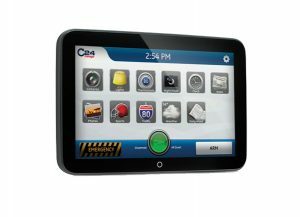 The Z-Wave® connectivity module lets you integrate security, lighting, thermostats and more in one self-contained system providing complete local control at the panel (an optional Wi-Fi enabled wireless AndroidTM tablet keypad is also available). When combining LYNX Touch with Honeywell Total ConnectTM Remote Services, users can control security, thermostats, lighting, locks and more using their smartphones or PCs from anywhere in the world. Easy access emergency keys (Fire, Auxiliary or Medical, and Panic). 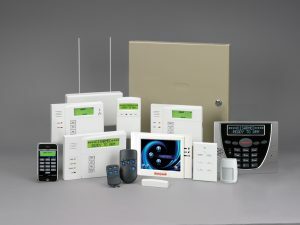 Program up to 16 individual access codes with LTE radio option for wireless monitoring and Honeywell Total Connect features. Telguard Interactive from Premier Security Inc. can be added onto any new security system installation on a home or business to provide wireless cellular LTE alarm monitoring with system alarm alerts by texts and emails and remote arming and disarming capabilities.